Good Night Mark Hanna where ever you are! My prayer, "May Lee Atwater (AKA Harvey Leroy Atwater) live in the hearts of men forever and ever, Ahmew. Karl Rove Cuts and Runs before the Ship of State, foundering, sinks; God has more life boats for the chosen. Turd Blossom and Lee Atwater have the same finger prints; a genius for digression into the dark side. Cut and Run Karl Run and Run and Run, Do Run Run. 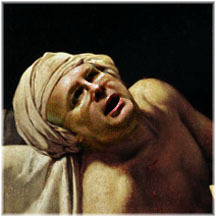 Jacques-Louis David does Karl Rove: political murders or suicide? 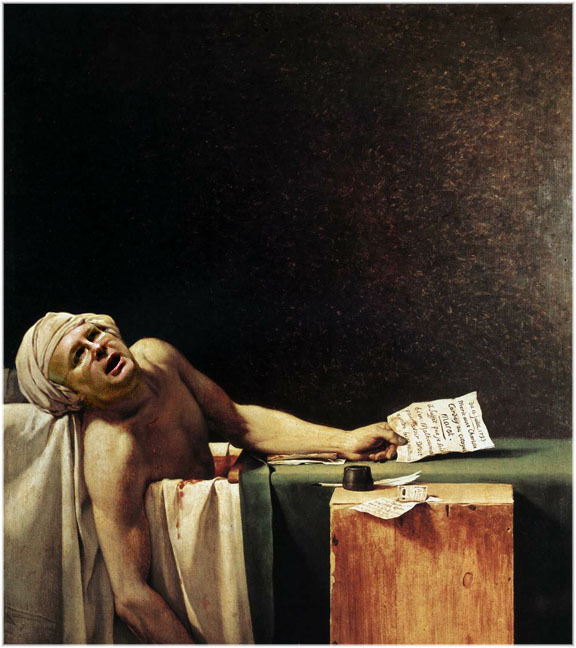 Marat and Karl Rove are ideologies of some stuff. Engineering foment is a nasty job and requires single mindedness with an idology that can inspire the less thoughtful, more ignorant to follow into the morass of zealotry. So here we are Karl, Humpty Dumpty sat on a wall. Who puts the pieces back together again? What was it all about Karl? There is Ted Haggard and there is Moral Hazard and then there is Karl Rove. Karl is Beyond Moral Hazard, Karl Rove is a hazard to our entire nation. endeavoring to turn night into day and day into night. The departure of Alberto Gonzales from the Attorney General's Office brings America to a place of definitions, and hanging in the balance is the very idea of the nation itself. The basic concepts and fundamental principles of our republic now stand as the only legitimate considerations going forward, for they have been tested almost to annihilation already, and will not endure much longer if we continue on this path. It is the mythology within the Declaration of Independence we speak of, the fiction that tells us we are endowed with rights, and that those rights are unalienable. This falsehood has been vividly exposed in the last several years, and it has been a harsh lesson indeed. All the rights we hold dear and believe to be our greatest strength are, in fact, only words on old paper with neither force nor power. The next line - "That to secure these rights, Governments are instituted among Men, deriving their just powers from the consent of the governed" - is the muscle behind the myth, the core that has endured a withering assault. Matters are so much worse than our national political dialogue lets on. The resignation of Gonzales has unleashed a torrent of hard words and harsh criticisms aimed at the deplorable nature of his tenure, but the truth of it continues to elude mention. They call Gonzales an incompetent, a crony, a loyalist, a disgrace, leaving off the one word necessary to fully explain who he is, and what he was engaged in before he stepped down. 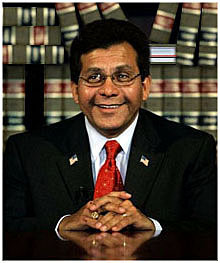 Alberto Gonzales is a traitor. That is the only word to explain it. He is not the only one; there are many more traitors like him in the Bush administration, criminals joined in an act of treason so vast and comprehensive that it beggars comparison. Nothing quite like this has ever before been attempted in America, and if they are allowed to succeed, there will be nothing of what defines America left to be seen. Gonzales and his Bush administration collaborators have committed their treason against the rule of law itself, a crime so absolute that it is technically not illegal. There is no code, ordinance or law specifically forbidding the total ruination of all our rights and protections; the act is neither felony nor misdemeanor, because nobody ever considered the black-letter necessity of making it illegal to destroy the rule of law. But there is no America without that rule of law - no rights, no protections, no Constitution; there is nothing, and if you destroy the rule of law, you destroy the idea that is America itself. The only word for a crime like that is treason, and those who would dare commit it are traitors. Gonzales and his Bush administration collaborators have done more than dare. They have been pursuing it, with deliberation and intent, throughout each moment of their tenure. Their treason is not in the actual crimes they have committed, but in the way they have chosen to avoid accountability for them. Their treason is not their refusal to obey the Freedom of Information Act, but in their insistence that they are above the application of that law. Their treason is not in their refusal to obey subpoenas from Congress, but in their claim that they are above the laws behind those subpoenas. Their treason is not that they fired United States attorneys and then refused to come clean about it, but that they decimated the impartiality of the Department of Justice and turned the rule of law into another partisan weapon. Their treason is not the NSA surveillance of Americans, but their steadfast refusal to submit to the governing laws and the requirement of oversight. George Bush, the willing empty vessel holds a very big bag of uglies. it is hoped: after this rant, Karl Rove will never desire another bath, 8/20/07, G.O.K. In 2005 Scari.org published the end-all for Karl Rove. Now relegated to being a talking head, we can gage his compass. 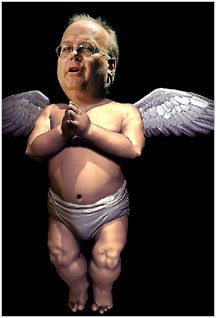 Karl Rove, Angel of Perfidy praying for a better data base, The Angel of Perfidity can speak in many tongues too. from The Decider but the terror goes on. The Terror is still there but "The Architect" takes his leave. If he were a true revolutionary he'd atleast stamd to the end just to see how it all comes out. The worm in Bush's Brain leaves its host. and you, all of you, will be left to just study what we do as we change water to wine while running with scissors." and beauty is the Apocalypse. "Changing water to wine while running with scissors is the fastest best solution to the problem of faith. Doubt is not an option when scriptural evidence is introduced." "It is regrettable that plausible deniability is insufficient in cases like these and deniable plausibility may become the norm in future discussion"  by decree  beside taking the 5th, rather, failure to recall  absence of memory or forgetfullness are sufficient to parry the courts in any inquiry henceforth. "Keep you eye on the Ball"
We all should remember, we should. On the eve of Gulf War II during the Senate Hearing on war powers for the use of preemptive force. Joe Biden said again and again, "KEEP YOUR EYE ON THE BALL." It was a simple request, keep your eye on the ball. But we, the public, watched as this, unfairly elected, administration double dribbled, clipped, barged at the mark and stepped out of bounds -- yes Joe Biden made a simple request of us and we let him down. The Morally Hazardous, ethically tone deaf Karl Rove has done more for the complection of politics than Machiavelli, Joe McArthy, Robespierre and Joseph Goebbels: it is hoped history will take note. with clean desk books akimbo but law is safe. Anytime you get "the word" second hand you know it's from an unreliable narrator.